Product prices and availability are accurate as of 2019-04-25 17:47:04 EDT and are subject to change. Any price and availability information displayed on http://www.amazon.com/ at the time of purchase will apply to the purchase of this product. 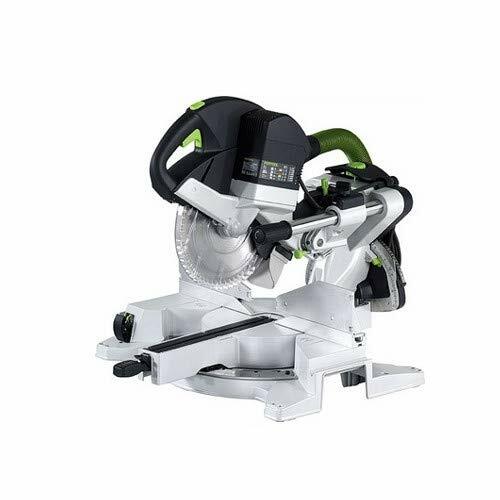 The Festool Kapex miter saw comes with Festool's high-quality 60-tooth carbide blade for use when cutting woods or soft plastics, an angle transfer device, a hold-down clamp for securing material, and a wrench for unit adjustments. Compact and lightweight at 21.5 kg (47 pounds), you can use the fine adjustment knob to control bevel angles in fractions of a degree. The bevel knob has three settings: positive detents at 0 and -45 degrees, free movement between -45 and +45 degrees, and free movement up to +/- 47 degrees. Bevels can be made to the left or right, and the bevel gauge appears on both sides of the saw. The Kapex blade creates a thin kerf which reduces load on the motor and improves the cut quality. The blades are specially designed to reduce noise levels and dampen vibration. The large 30mm arbor hole reduces blade deflection. A special cutting position allows the Kapex to have a cutting capacity as large as 4-3/4-inches (120mm). The deck height of the Kapex matches the height of our systainer 1 storage containers. On the job site, you can use one or more systainers to support the material being cut. The difference in height between the MFT/3 and MFT/3-Kapex multifunction tables is also equal to the height of the deck providing optimal work flow and support. The Magnesium alloy base of the Kapex was designed to be extremely rigid and durable yet very lightweight. Rubber feet in each corner provide useful traction and fit into the grid hole pattern of any Festool multi-function table. 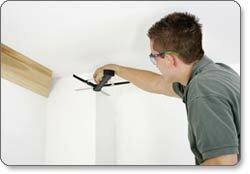 Features Festools patented FastFix blade change system. Turning the FastFix knob locks the arbor, mechanically locks out the trigger, and allows the blade to be changed with a single hand. Dual-line lasers define the entire cut area. 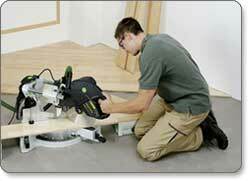 Festool products can only be sold in the 50 states. Compact and incredibly precise, the Festool Kapex KS 120 Sliding Compound Miter Saw delivers professional results in the workshop and on the job site. Advanced electronics, dual laser guides, micro-bevel adjustments, quick-release fences, and easy-to-reference scales all help you maintain control over cuts. And a host of other smart features help keep the saw's footprint small and its body light and portable--all without sacrificing power, accuracy, or dust extraction capability. Dust Extraction Port sends debris away from your work area. Stainless steel miter scale features a fine adjustment knob. Convenient deck height eases work flow.View larger. MiterFast angle-transfer device gives you quick, accurate results. View larger. The lightweight magnesium-alloy base makes for easy transport. View larger. Integrates with MiterFast. View larger. The Bevel Lock Knob holds your desired angle. Keyed, non-slip material clamp keeps your material in place. The dual lasers clearly define the material which will be removed during the cut, and their design allows you to align cuts from the left right side of the Kapex KS 120. Three-axis adjustment controls make fine-tuning the lasers easy, and the lasers are electrically powered and require no batteries. Also, a convenient button allows them to be operated without turning on the saw. Once you've determined your cut line, a center-positioned handle allows you to make cuts with either hand, while a two-stage trigger helps prevent accidental triggering. The Kapex KS 120's etched, stainless-steel miter scale offers large, easy-to-read angles--up to 50-degrees on the left and 60-degrees on the right. Positioned far from the axis of rotation, this scale allows for setups that are accurate within fractions of a degree. And once you've identified the desired setting, the miter lock on the Kapex provides an extremely aggressive hold to prevent inadvertent movement--even when near a positive detent. Transfer of inside and outside angles from your work piece to the Kapex KS 120 is quick and easy, thanks to the included MiterFast angle-transfer device, which provides a reflective surface for use with the saw's lasers, as well as a sturdy lock that prevents slippage and keeps measurements accurate. The Kapex KS 120 allows for both left and right bevels, and a fine-adjustment knob controls the bevel of each cut within fractions of a degree. This bevel knob features three settings: positive detents at 0 and -45 degrees, free movement between -45 and +45 degrees, and free movement up to +/-47 degrees. The knob rotates and engages a rack and pinion to move the head, which is counter spring balanced. This means that once you set a bevel angle there's no need to worry about it shifting before you engage the dependable bevel lock. For added convenience, there are bevel gauges on both sides of the saw, and the large bevel-adjustment scale is easy to read. For added peace of mind, your work piece is held in place by a sturdy, nonslip clamp, which is keyed to make insertion and removal of materials quick and easy. A single, lever-actuated cam-lock secures the clamp in place and a rubber pad protects your work piece, while the clamp's oblong foot provides a flat surface to place against the saw's fence. Also contributing to the Kapex KS 120's accuracy is its rail-forward design. The saw's robust, 30-millimeter rails are set wide apart to prevent head play and ensure smooth, accurate cuts. This design also allows the saw to be placed against a wall during use, which saves valuable workspace. 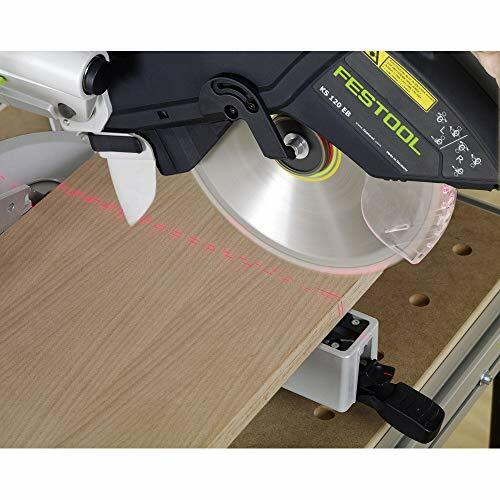 The Kapex KS 120 uses specially designed thin-kerf blades that reduce stress on the saw's motor, reduce noise levels, and dampen vibration for cleaner cuts in a variety of applications. It offers expanded cutting capacity by offering access to a "special cutting position" that utilizes the back portion of the blade more effectively. 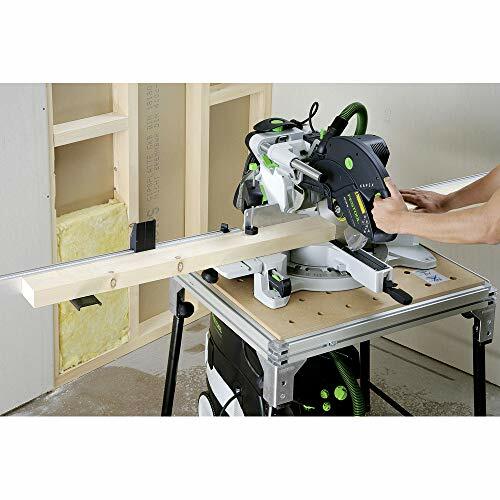 This means that by simply flipping a lever to put the saw in this position, you can cut 6-5/8-inch crown molding or cut vertical materials that measure up to 4-3/4-inches by 3/4-inch. Similarly, simply flipping a knob allows the Kapex KS 120 to cut trenches, so you can create lap joints or pieces that fit around pipes and other obstacles. Different applications place different demands on your tools, and the Kapex KS 120 offers variable speed control from 1,400 to 3,400 rpm for equally good results when working with a variety of materials. With its constant speed monitoring, the saw is able to maintain consistent blade speeds under heavy loads, which produces clean, consistent results. Soft-start technology prevents jolts at start-up and improves your control over cuts, while overload protection extends the life of the saw. Also contributing to the Kapex KS 120's performance is a 1,600-watt direct-drive motor, which offers efficient transfer of energy to the blade and features a magnetic brake that reduces the amount of time that the blade takes to spin down. 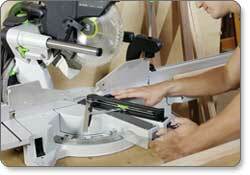 With Festool's patented FastFix system, blade changes are fast, easy, and intuitive. Turning the FastFix knob locks the arbor and mechanically locks the trigger, so you don't have to worry about accidental start-ups. This allows the blade to be changed with a single hand, while a cupped steel arbor nut prevents accidental over-torquing and damage to the saw and blade. Featuring magnesium-alloy base, the Kapex KS 120 is rigid and durable yet it weighs just 47 pounds--extremely light for a 10-inch miter saw. This makes it easy to move from workshop to job site and back again. Two handle locations allow you to keep the saw's center of gravity near your body while carrying it, reducing the strain on your back. Plus, the Kapex's head locks down for transport, keeping the saw compact and preventing unexpected movement from throwing you off balance. 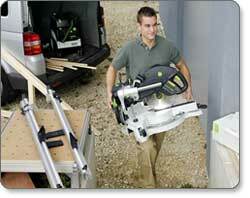 The saw's travel-friendly design also offers onboard storage for the arbor tool and the power cord. 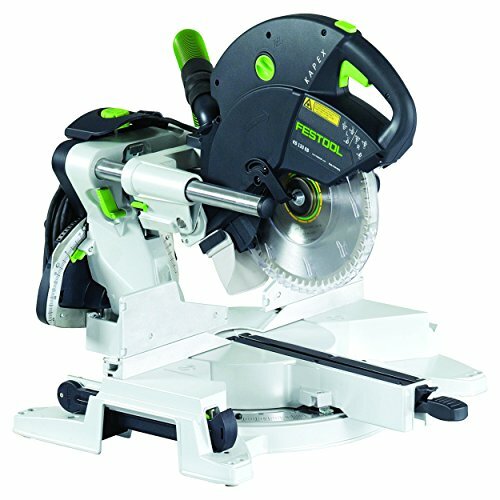 This dependable compound miter saw also offers a swiveling dust port that directs dust away from you and your work surface, improving job-site safety and minimizing cleanup time. A pliable, rubber dust hood directs saw dust from the blade into the dust collection port as you work, arresting chips and improving the rate of capture. This integrated port accepts both 27-millimeter and 36-millimeter hoses, and it can be used with a Festool CT dust extractor to achieve impressive 91-percent sawdust collection. 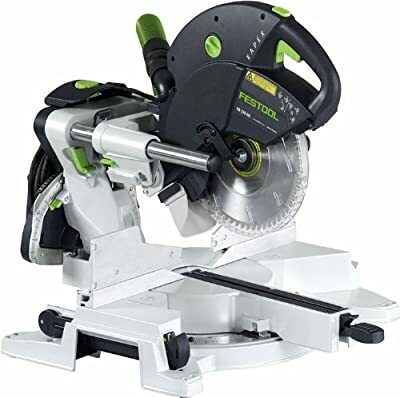 Festool Kapex KS 120 Sliding Compound Miter Saw, angle transfer device, 60-tooth carbide blade, hold down clamp, and wrench. The KS 120's "Special Cutting Position" uses more of the blade, so you can tackle more types of jobs.